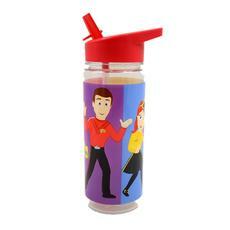 Little ones will enjoy learning how to self-feed with this adorable drink bottle from The Wiggles. Featuring sippy lid with built-in straw, it is designed to go from sippy cup style to regular drink bottle as your toddler grows. Products made with Tritan give you the look and style of glass, with superior durability and shatter resistance. This Tritan water bottle is also BPA free & dishwasher safe. My 1.5 year old is in love with this water bottle. Wiggles stuff is hard to find in Canada! So glad to have found this online!